On Friday, July 13, we were underway again. . .
On Friday, July 13, we were underway again. . . this time as part of Task Force 95. Next thing we knew we were back at Okinawa and anchored in Buckner Bay. 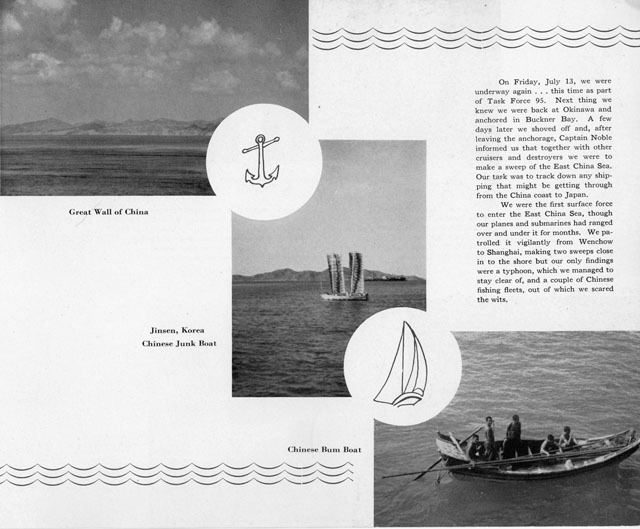 A few days later we shoved off and, after leaving the anchorage, Captain Noble informed us that together with other cruisers and destroyers we were to make a sweep of the East China Sea. Our task was to track down any shipping that might be getting through from the China coast to Japan. We were the first surface force to enter the East China Sea, though our planes and submarines had ranged over and under it for months. We patrolled it vigilantly from Wenchow to Shanghai, making two sweeps close in to the shore but our only findings were a typhoon, which. we managed to stay clear of, and a couple of Chinese fishing fleets, out of which we scared the wits.